A visitor has worries about a dog whose teeth have been cut. While there are several reasons for clipping a dog's teeth, it's something only a vet should do. Learn about situations where it might be necessary. Are there any concerns I should have about a dog that has had his teeth cut? When you say that the teeth were cut, I'm assuming you mean the tips of the canines have been clipped off. Write back to correct me if I'm wrong about that, but I'll base my answer on that assumption for now. Whether you have anything to worry about depends on how old your dog is, what you intend to use your dog for and if the tips were clipped due to a behavioral issue. First, puppy canines are sometimes clipped if they are not ready to come out, but they are interfering with jaw alignment or new teeth coming in. Clipping off just the tips can remove interference and allow the jaw to move freely. 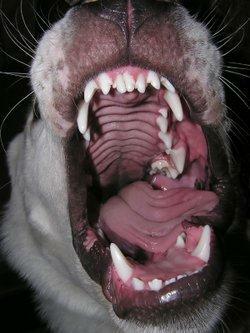 This is actually quite harmless to the pup because these teeth have very little root or nerves to speak of. Once the puppy teeth fall out that's the end of it. I would only be concerned about clipped puppy teeth if you bought this dog as a show and/or breeding prospect. Tooth and bite alignment problems are hereditary. Clipped teeth on an adult dog could be evidence of a biting problem. In cases like this, people clip off the tips of the canines so the dog can't dig them in when he bites. Even so, this could quickly lead to decay on the exposed dentin, so I'd recommend having a vet take a look. As you can see, there are some variables here, so you'll have to adapt my thoughts to your own situation to decide if there is a problem. If you're dealing with an adult dog, and you haven't had any behavior problems so far, then maybe there's nothing to worry about.